TDSPWR3 power measurement and analysis software transforms Tektronix digital oscilloscopes into sophisticated analysis tools that quickly measure and analyze power dissipation in power supply switching devices and magnetic components, and then generates detailed test reports in customizable formats. TDSPWR3, used with a Tektronix TDS5000B, TDS7000/7000B, CSA7000 Series or TDS6000B models oscilloscope and differential voltage and current probes, forms a complete measurement system for power supply design and test. To improve the efficiency of switching power supplies with increased power densities, designers need to analyze power dissipation and characterize transitions at higher switching frequencies. Using TDSPWR3’s unique switching loss and B-H analysis features, you can measure switching and magnetic device power dissipation with a touch of a button. Tektronix oscilloscopes’ high bandwidth, high sample rate and deep memory, combined with the TDSPWR3, enable you to efficiently and accurately characterize switching power supplies by measuring power loss at the switching device and magnetic component. Reliability at the component level of the switching power supply can be analyzed using Safe operating area with mask test capability and measuring the peak flux density. With the current harmonic standard (EMC) being imposed worldwide to maximize the efficiency of the existing total generation capacity, compliance to the IEC EN61000-3-2, EN61000-3-2 AM14 is critical. Reduce your development and testing time by using the precompliance testing capability of TDSPWR3 to test power supply designs to these standards from your bench. TDSPWR3 enables you to set units and scale factor for Tektronix current and voltage probes to read the result in the right unit. Automated deskew capabilities help you to get accurate results. Power Device Analysis - Switching Loss, HiPower Finder, B-H Analysis, Magnetic Loss, Inductance, Maximum Magnetic Flux Density, Permeability, Remanence Flux Density, Coercive Force, Total Loss*1, Safe Operating Area (SOA), Gated SOA, SOA Mask Editor with Mask Testing, Dynamic On Resistance, di/dt, dv/dt. Line Power Measurements - True Power, Apparent Power, Power Factor, Crest Factor, Current Harmonic, THD, Precompliance testing for EN61000-3-2, EN61000-3-2 AM14 standard and MIL standard 1399 (400 Hz). 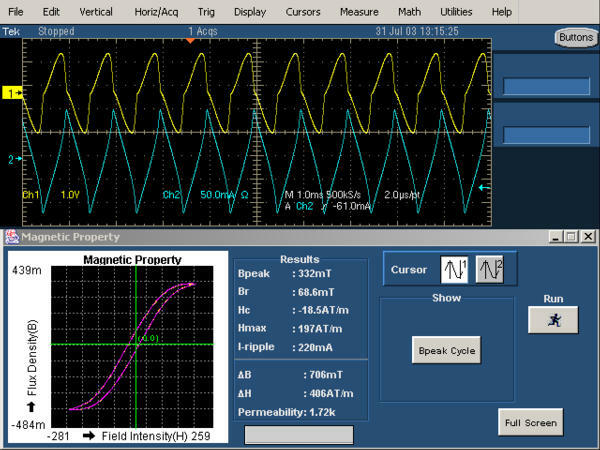 Output Measurement - Ripple due to line frequency and switching frequency, Turn on time. Modulation Analysis - Pulse Width, Duty Cycle, Period, and Frequency variation vs. Time. Spectral Analysis - Automated Spectral analyses by setting start frequency, stop frequency, and resolution bandwidth. Report Generation - Create template, custom report layout, and report generation. *1 Total loss measurement needs four channels; it is not supported in TDS5032B or TDS5052B. TDS5000B Series Digital Phosphor Oscilloscopes - TDS5032B, TDS5034B, TDS5054B, TDS5054BE, TDS5052B, TDS5104B. TDS7000/7000B Series Digital Phosphor Oscilloscopes - TDS7054, TDS7104, TDS7154B*2, TDS7254B*2, TDS7404B*2. *2 A TCA-1MEG TekConnect 1 MΩ buffer amplifier is required to use a 1 MΩ differential probe with the TDS7154B/TDS7254B/TDS7404B, TDS6000B models, and CSA7000 Series oscilloscopes.